Ten years ago, the name of Falun Gong was thrust into the media spotlight around the world, as 10,000 gathered at the Chinese central government compound. Two of those present on that day in 1999 talk to the Epoch Times about the significance of the event, often shrouded in misunderstanding and confusion. Even at the time, it was regarded as a remarkable event, finding its way into newspapers, broadcasts and news bulletins around the world. The image of 10,000 people appealing near the central compound of China's leaders shocked people inside and outside China, evoking memories of the courage, scale, tensions and hopes of the Tiananmen Square incident just ten years before. But the true historical significance of April 25th, 1999 was to be revealed months later, when it became apparent that the event had been manipulated by the head of the Communist Party to set in motion a campaign of violence, torture and persecution against 100 million people. The appellants on that day ten years ago all had one thing in common: they practised the spiritual discipline of Falun Gong. A practice of meditation and self-cultivation, Falun Gong had been steadily growing in popularity in China for several years, amassing an estimated 100 million followers, and in doing so had attracted more and more attention from the ruling Chinese Communist Party. Along with the increased attention of the regime had come increasing incidents of harassment of Falun Gong practitioners and publications of articles slandering Falun Gong in the state-run media. The appeal of April 25th had in fact been sparked by the arrest of 45 practitioners in the nearby city of Tianjin, explains Zhao Liping, who was one of the 10,000 appellants. Liping, who now lives in Birmingham in the UK, decided to go to the Central Appeals Office in Zhongnanhai – the central government compound and home to the nation’s leaders and their offices. Like many other practitioners in the local area, she simply decided to go of her own accord. With so many Falun Gong practitioners in China at the time (around 7 per cent of the population), the news of the Tianjin incident prompted thousands of others like her to go. “At the time, I didn’t know the persecution was coming. I just had one simple thought: I wanted to go to Zhongnanhai to go tell them my own personal story of how Falun Gong benefited my life to the government. So that is why I went,” she said. Falun Gong practitioners like Liping often emphasise the peaceful nature of the April 25th Appeal, which they attribute to the spiritual values behind the practice of Falun Gong derived from its core teaching of truthfulness, compassion and forbearance. “When I arrived at 8a.m. outside Zhongnanhai, there was a gathering of many people. The police were telling them which side to stand. All the practitioners stood in the right place without causing trouble. “During the whole day, everyone just sat quietly or stood peacefully. There was no shouting, people were just reading or meditating. Everyone was just queuing to share their views at the Appeals Office. The reason that Li emphasises the peaceful nature of the appeal, is that it was later portrayed through the state-run media as a disorderly “siege” of the central government compound and became one of the initial justifications for the nationwide campaign of persecution that began on July 20th that same year. But the second in command to Jiang Zemin at the time, Chinese premier Zhu Rongji, does not appear to have shared Jiang’s views on Falun Gong. Nor do his actions support Jiang’s later claim of a “siege”. On April 25th, Zhu Rongji actually came out to the street to meet with the practitioners. He invited practitioners into his office to explain their appeal. Three people volunteered to be spokespersons. After a discussion explaining the physical and mental benefits of Falun Gong with several officials, it was agreed that the arrested practitioners were to be set free and he said that the government should uphold its policy of not interfering with Falun Gong. But despite this peaceful resolution – unprecedented in the history of communist rule in China – Jiang had other ideas. “Hours after everyone dispersed, Jiang Zemin intervened to reverse the policy,” says a Falun Info Centre report. Over the following months Jiang then set about convincing the other leaders of the Communist Party that Falun Gong constituted a threat to the party’s grip on power – and should be destroyed. “He claimed Falun Gong had laid ‘siege’ to Zhongnanhai and that it will be an international embarrassment for the Party if it cannot defeat the Falun Gong,” says the Falun Info Centre report. To carry out Jiang’s campaign of persecution, a special gestapo-like organisation was created, called the 610 office, headed by a man called Luo Gan. It was an article written by Luo Gan’s brother-in-law in a magazine in Tianjin that had started the chain of events that led to the April 25th Appeal. He Zuoxiu wrote comments in a scientific magazine published in Tianjin, claiming that practising Falun Gong would cause mental disease, leading to Falun Gong destroying the country and the CCP. When practitioners in Tianjin went to the publishing company to tell them how Falun Gong had improved their health and minds, the editor agreed to write a correction in the next issue. However, they later changed their minds, resulting in more practitioners coming to the company. Both He Zuoxiu and Luo Gan worked for state-run media and wrote many critiques before the persecution began. 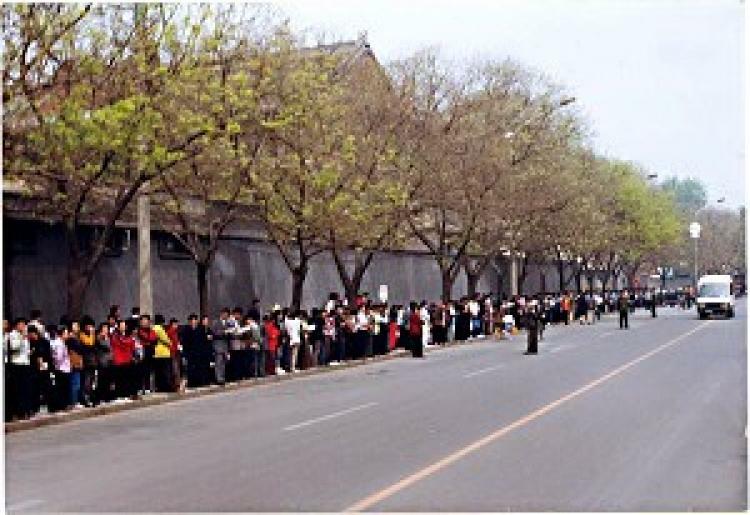 On April 22nd, 1999, an anti-riot police force was dispatched by the Tianjin Public Security Bureau to disperse the gathered practitioners. Some were arrested. The next day, the anti-riot force was sent again; this time they went further and assaulted practitioners. More than 40 people were arrested. Tianjin police later told practitioners that they needed to go to the Zhongnanhai Appeals Office if they wanted to solve the problem. “At the time, I believed in the Government at the time,” says Liping. “I trusted it. Many passers-by who saw us at the time thought we were so peaceful. I thought it would end nicely and the Tianjin practitioners would be released.